How are you adjusting to the recent time change? Our clocks fell back a week or two ago and now it is pitch black dark right when my kids desperately need to be running around outside. We have a trampoline and a backyard with lights, so I often send them outside to play... but as it gets colder and darker, we are finding ourselves inside earlier in the evening and the kids are stir crazy! Lately I've been trying to plan simple open ended art or easy science activities to do in those early evening hours before dinner and after homework gets finished up. The bickering and emotional outbursts seem to escalate around 5pm which means it is the perfect time for something new. Today I pulled out some semi-new plastic dinosaurs, a huge roll of paper, and paint and we did some painting with our toy dinosaurs. 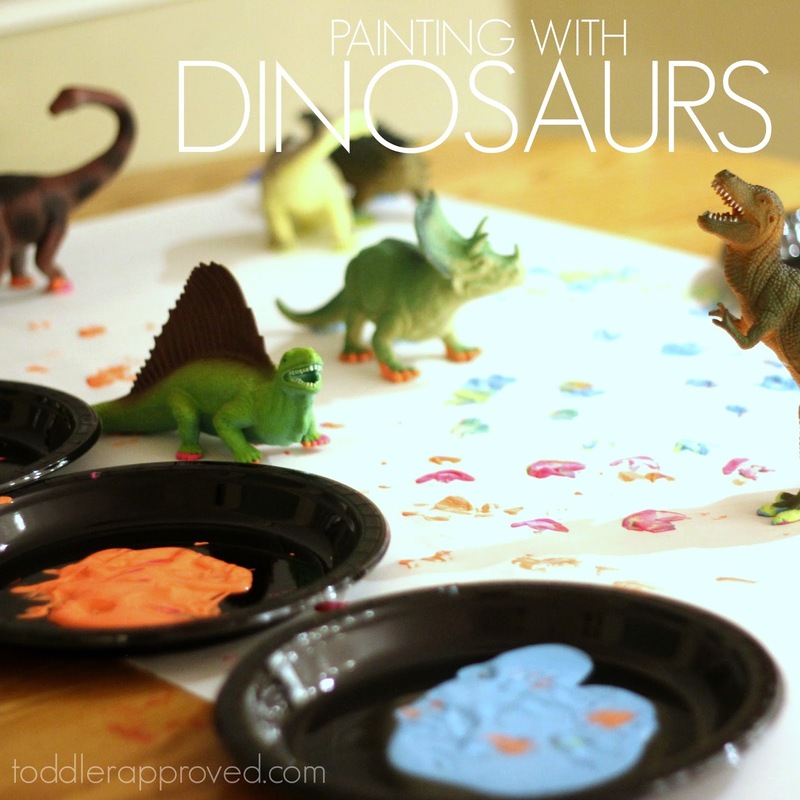 Have you ever painted with toy dinosaurs? Or any other toys? It is similar to painting with cars since you just put out a big roll of paper and paint and let kids enjoy making their marks with the toys! 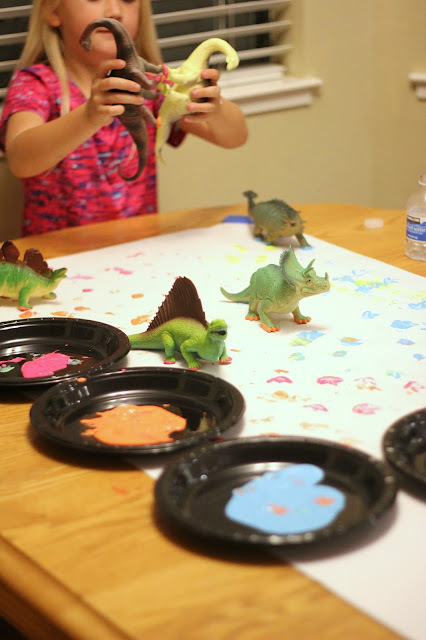 I thought it was especially neat to see how colorful the dinosaur feet got as the kids painted for longer and longer. 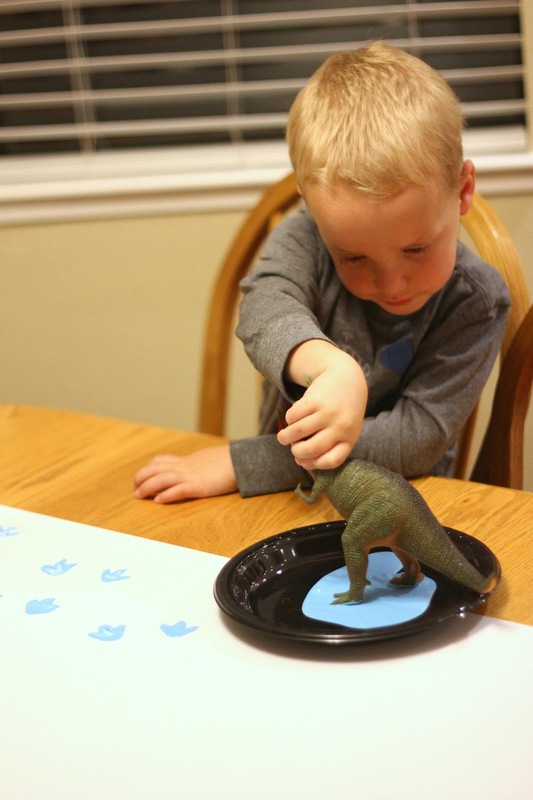 In addition to painting with dinosaurs, we actually made our own cardboard dinosaur earlier this week. We've also made name dinosaurs and dinosaur counting cards to help us work on a few early learning concepts. After we were done painting, we were left with a gorgeous colorful masterpiece that could've been hung or even turned into wrapping paper to decorate gifts with it. 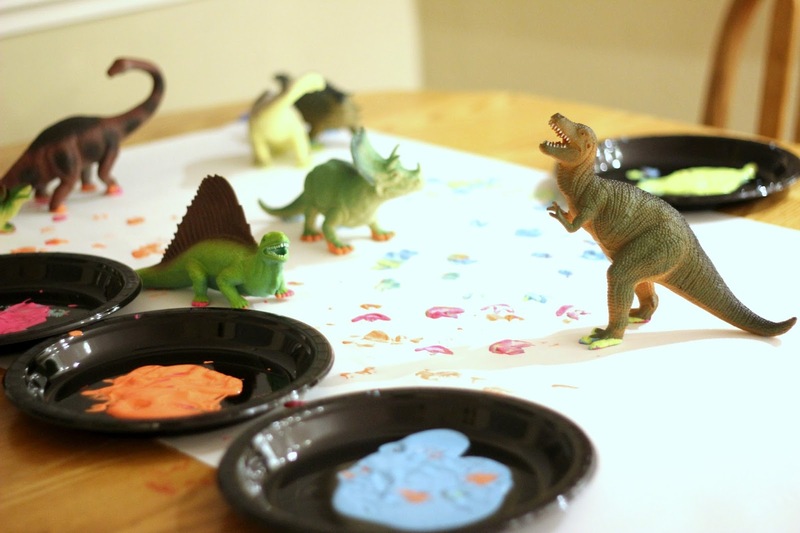 Painting with toy dinosaurs was so fun! 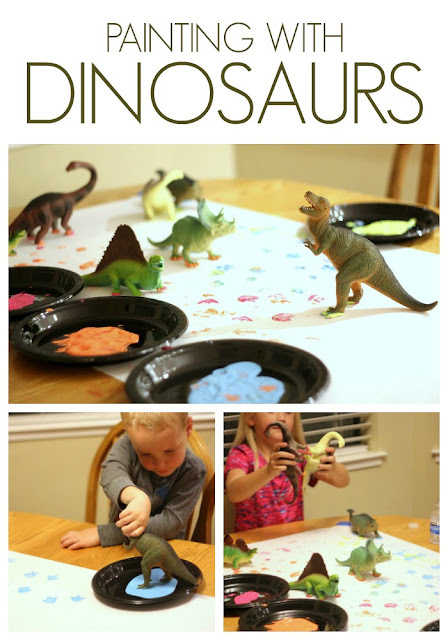 If you want to try out any other dinosaur crafts or activities, check out our recent Dinosaur Week post with all of the featured posts from this week. There are so many fun ones to try!